Elliott was delighted to receive a call from Savills one day, who wanted him to start on their commercial graduate scheme. "When I put the phone down, it dawned on me how much I had to achieve over the next eight months: a RICS accreditation; an MSc in Real Estate; and hopefully make a couple of friends too. Having graduated with a first-class honours degree from Kingston University I began the search for a suitable university to gain my MSc." 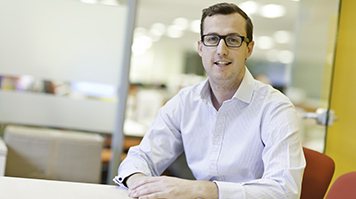 After weighing up his options and receiving advice from Savills' training manager, LSBU was the natural choice. When finding the right university, he wanted to keep his pencil case and notepad "within a tape measure's length of zone 1." "The MSc Real Estate is respected within the industry and holds its own against graduates from competing universities. One only need look at the esteemed alumni for proof: Nick Leslau, chief executive of Prestbury Group; Tony Giddings, chief executive of Argent Group; and Nigel Robson, executive director of Resolution Property. They all cut their teeth at LSBU and I aspired to join them." On his first day, it was a pleasant surprise to discover he'd be studying with several acquaintances that he'd met on internships. Over the summer he had month-long stints in the London offices of Savills and Hammerson, and met lots of people also starting their careers. "Internships enable you to make friends in the industry, strengthen your CV, demonstrate your commitment to the surveying profession to potential employees, and give you experience of how different firms work." Elliott enjoyed a heavy dose of real estate economics, finance and valuations, and a manageable workload. The lecturers are friendly, accommodating and supportive. I suspect that I'm going to become rather good friends with a large companion of mine: Parry's Valuation and Investment Tables. What seemed daunting when he first received that call from Savills was no longer so overwhelming – he had enrolled on a RICS accredited course, had a job waiting for me when he finished, and he's on the way to becoming a fully-fledged chartered surveyor. "The Vice Chancellor's scholarship has made a huge difference to my postgraduate experience, providing support at a juncture of my learning profession, which has allowed me to concentrate solely on my studies. I have taken the confidence gained from being awarded the Vice Chancellor's Scholarship to successfully find a graduate position at Savills, a leading global surveying consultancy."